"Frost giant" redirects here. For the music album, see Frost Giant (album). For the Marvel Comics frost giant, see Giants (Marvel Comics). For the Dungeons & Dragons frost giant, see Giant (Dungeons & Dragons). 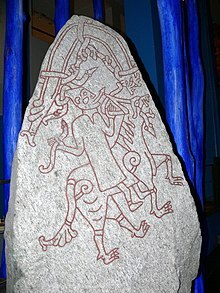 The jötunn Hyrrokkin, described in Gylfaginning as riding on a wolf with vipers as reins, is believed to be depicted on this 10th-century picture stone from the Hunnestad Monument. In Norse mythology, a jötunn (/ˈjɔːtʊn/; plural jötnar) is a type of entity contrasted with gods and other figures, such as dwarfs and elves. The entities are themselves ambiguously defined, variously referred to by several other terms, including risi, thurs, and troll. Although the term giant is sometimes used to gloss the word jötunn and its apparent synonyms in some translations and academic texts, jötnar are not necessarily notably large and may be described as exceedingly beautiful or as alarmingly grotesque. Some deities, such as Skaði and Gerðr, are themselves described as jötnar, and various well-attested deities, such as Odin, are descendants of the jötnar. Norse myth traces the origin of the jötnar to the proto-being Ymir, a result of growth of asexual reproduction from the entity's body. Ymir is later killed, his body dismembered to create the world, and the jötnar survive this event by way of sailing through a flood of Ymir's blood. The jötnar dwell in Jötunheimr. In later Scandinavian folklore, the ambiguity surrounding the entities gives way to negative portrayals. Old Norse jötunn (also jǫtunn, see Old Norse orthography) and Old English eóten developed from the Proto-Germanic masculine noun *etunaz. Philologist Vladimir Orel says that semantic connections between *etunaz with Proto-Germanic *etanan makes a relation between the two nouns likely. Proto-Germanic *etanan is reconstructed from Old Norse etall 'consuming', Old English etol 'voracious, gluttonous', and Old High German filu-ezzal 'greedy'. Old Norse risi and Old High German riso derive from the Proto-Germanic masculine noun *wrisjon. Orel observes that the Old Saxon adjective wrisi-līke 'enormous' is likely also connected. Old Norse þurs, Old English ðyrs, and Old High German duris 'devil, evil spirit' derive from the Proto-Germanic masculine noun *þur(i)saz, itself derived form Proto-Germanic *þurēnan, which is etymologically connected to Sanskrit turá- 'strong, powerful, rich'. For discussion regarding Old Norse troll and its development, see troll. Several terms are used specifically to refer to female entities that fall into this category, including íviðja (plural íviðjur) and gýgr (plural gýgjar). A bergrisi—the traditional protector of Southwestern Iceland—appears as a supporter on the coat of arms of Iceland. The jötnar are frequently attested throughout the Old Norse record. For example, in a stanza of Völuspá hin skamma (found in the poem Hyndluljóð), a variety of origins are provided: völvas are descended from Viðòlfr, all seers from Vilmeiðr, all charm-workers from Svarthöfði, and all jötnar descend from Ymir. ^ "Jotun". Random House Webster's Unabridged Dictionary. ^ Some translators of the Poetic Edda do not render the word jötunn to giant. For example, in the Foreword to Jeramy Dodds's translation of the Poetic Edda, Terry Gunnell says that jötnar is "sometimes wrongly translated as 'giants'" and instead uses jötunns. (Dodds 2014:9). ^ a b c Orel (2003:86). ^ Bellows (1923:229) and Thorpe (1866:111). Wikimedia Commons has media related to Jötnar. Dodds, Jeramy (Trans.) (2014). The Poetic Edda. Coach House Books. ISBN 978 1 55245 2967. Bellows, Henry Adams (Trans.) (1936). The Poetic Edda. Princeton University Press. New York: The American-Scandinavian Foundation. Thorpe, Benjamin (Trans.) (1866). Edda Sæmundar Hinns Frôða: The Edda of Sæmund the Learned. Part I. London: Trübner & Co.